“I pulled down like 5 posters about the repeal launch walking around campus today,” said Ní Chonghaile in one of the messages. Sorcha Ni Chonghaile messages into ‘Prolife Dcu’ groupchat. 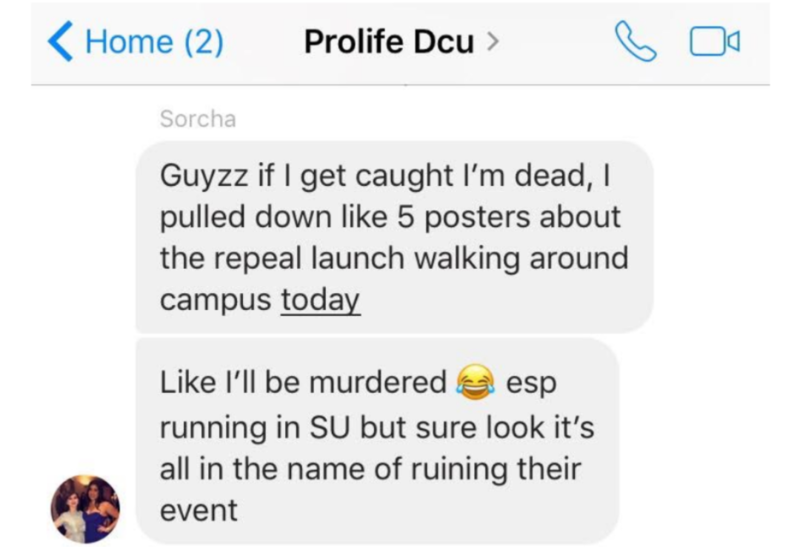 “Like I’ll be murdered (laughing face emoji) esp running in SU but sure look it’s all in the name of ruining their event,” wrote Ní Chonghaile in another message into the group chat. 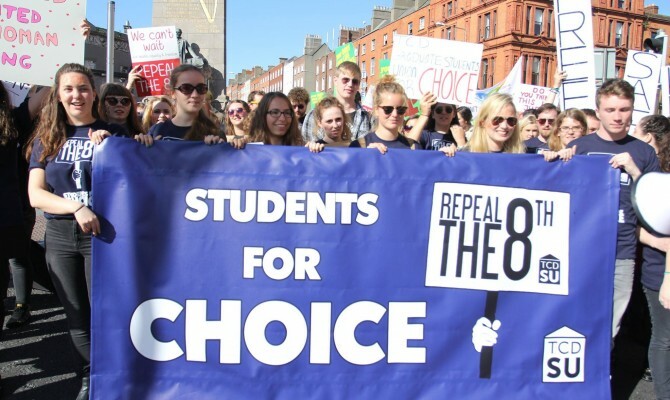 DCU adopted a pro-choice stance leading up to the referendum on repealing the 8th Amendment after students in the University voted for DCU to represent them in that way. The Repeal launch was prior to the SU election where Ní Chonghaile ran for her role opposed by Ciara Doyle. 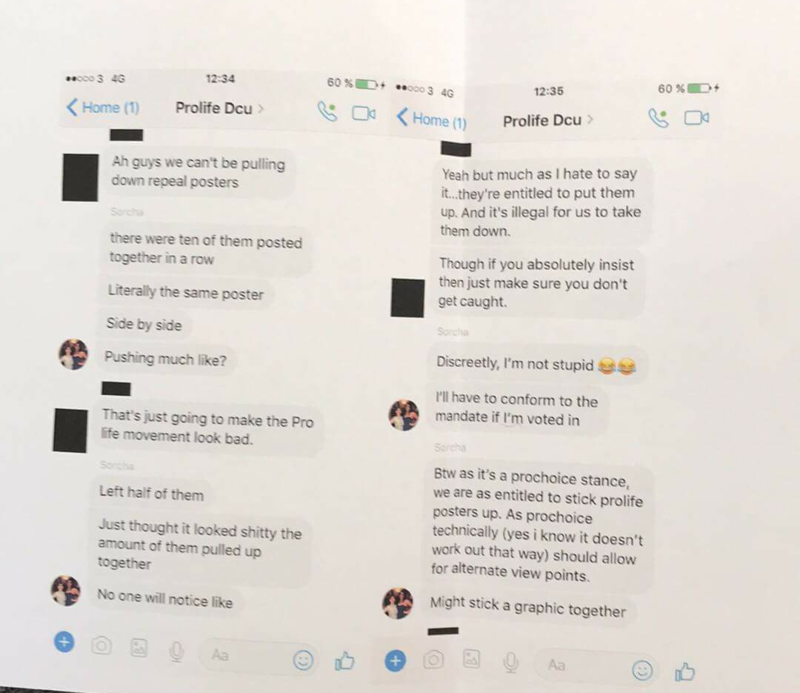 Another member of the chat said that Ní Chonghaile taking down posters would “make the Pro life movement look bad” and to make sure she did not get caught. “Discreetly, I’m not stupid. I’ll have to conform to the mandate if I’m voted in,” replied Ní Chonghaile. Messages sent by Sorcha Ni Chonghaile given to The College View. Present SU members were not made aware of the messages however a message left with the screenshots said the sharer would be contacting SU members about the issue. “I know nothing about the issue and haven’t received any emails about it,” said Aisling Fagan, DCUSU VP for Equality and Welfare for 2018/2019.